I met Thea Halo last month at a conference of the International Network of Genocide Scholars in San Francisco. A writer, poet and artist, she is also the daughter of Sano Halo, now 103. San Halo was born Themia, into a Pontic Greek community in northern Turkey. 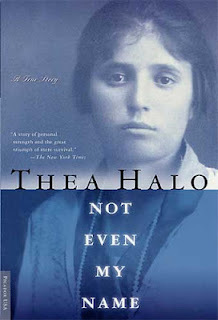 Many human rights and genocide scholars are aware of the Turkish genocide of the Armenians in 1915, but fewer are aware of the enormous scale of the tragedy that befell other Christian groups in Turkey at the end of World War I.
Thea Halo starts the book by describing a trip she took with her mother, then 79, to find her lost Pontic village. She then tells her mother’s story in an imaginative first-person style, interspersing some necessary background information. Themia was born into a relatively prosperous blacksmith’s family, living in two rooms with her parents, one brother, four sisters, her grandparents, and her uncle and aunt and their children. She remembers a loving, closely-knit family, feeling happy and needed. When she was nine or ten Turkish soldiers ordered the family out of the village on a long death-march south, without food, water, shelter, or any other necessities of life. Ironically, the Muslim soldiers who guarded the long convoy of suffering Greek Christians carefully stopped for prayers along the way, unaware that their religion would never have tolerated the massive suffering they were causing. Along the way, three sisters died, leaving Themia with only her mother, father, one sister and he brother. At that point the family had stopped near a tiny village. There, a woman proposed to take in Themia to help with her children, and Themia’s mother agreed. The woman renamed Themia Sano, the name she bore for the rest of her life. Sano stayed there, treated like a slave labourer, constantly threatened with beatings and worse, until she finally fled to an Assyrian Christian family in a nearly town. Meantime, her remaining sister and her mother died, and her father and brother disappeared. That was the last she saw of her family. Soon thereafter, the Assyrian Christians were also ordered onto the road and expelled from Turkey. Sano and the family who had taken her in ended up in Aleppo in Syria. When she was fifteen, the father of this family gave her in marriage to a 46-year-old Assyrian Christian who had been in America since 1905. He “paid” $100.00 in gold coins for her to the family that had protected her. She spent the rest of her life in the US, raising ten children, including Thea. This bare-bones summary of the story does not convey the beauty of Thea Halo’s writing, the pictures of Turkey she evokes, the sadness of the forced marches, or Sano Halo’s fears and reactions when she was married to a man she did not know but eventually came to love. I recommend this book to anyone who enjoys reading historical biographies: I also recommend it as a first step to anyone who would like to know more about the expulsion of Pontic Greeks from Turkey.